Our Imagination Ice Rinks are created with synthetic ice panels that are fitted together like a seamless puzzle to create a customized ice rink of just about any size and shape you envision. Provided you have a flat surface, we have a solution for your event. The cutting-edge design of the synthetic ice allows you and your guests to use the cutting-edges of figure skates or hockey skates. On Imagination Ice, your guests can perform all the main maneuvers they would on real ice without the chill. You might get the chills, however, seeing how much money you will save and how much more convenient an Imagination Ice Rink is compared with refrigerated ice rinks. If you want us to plan the entire party with a party theme, ice rink, catering, entertainment and anything else your heart desires, we are ready to do so. If you already know what you want and just want us to set up, operate and take down your ice rink (See Imagination Ice Rink Package below), we can do that too. As event planners in Northern Texas, we will bring our understanding of the entire event to every solution we provide to you to meet with your and your guests’ satisfaction. 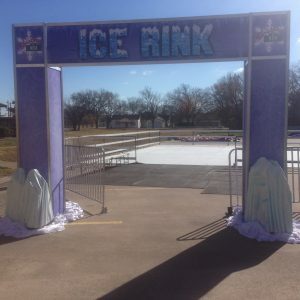 Call us at (972) 429-4545 or complete the form above for a complimentary consultation and quote on how an ice rink can help you create a “Wow!” memory at your next party! We can provide you with a synthetic ice rink in Wylie, Plano, Richardson, Allen, McKinney, Highland Park, North Dallas, Frisco Texas in no time!